These routes are especially good for walkers. You can walk in the footsteps of shoguns as you follow ancient trade routes through medieval towns, lush valleys, and misty forests. 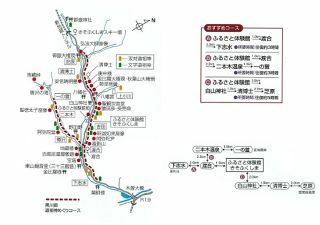 The walk starts from the Kisouma-no-sato (1,100m) on the Kaida Kogen highland passing the Jizo-toge pass, Karasawa waterfall and to Nihongi-no-yu hot spring (790m). You will go up and down throughout the course. You can see Mt. Ontake from the Jizo-toge pass observatory. This area is popular to hike, and we recommend you to use the Nihongi-no-yu hot spring after hiking. *The car rode will be closed during the winter. Pleaes use snow shoes to walk. A walking course through Kurokawago, an area that leads to Kaida Kogen highland from Kiso-machi area. You will find many stone monuments on the way, which is well known for its number of Dousojin monuments within the Kiso area. Especially you can see many So-tai Dosojins (two stone figures), and the oldest one dates back to 1802. The warm feel of the the Dosojin will soothe your heart together with the scenery of the countryside and the beautiful flowers. There are many places to see in this area: Karasawa waterfall, Nihongi-no-yu (hot spring), and grave of Abe no Seimei. This course will allow you to walk through the Hidakaido road and up into the Nishino-toge Pass. Start the walk from the Kaida Kogen tourist information center and walk through Kisouma-no-sato into the Hidakaido road. You will see the Tabanosawa Hieda-nohi, Tabanosawa community, tranquil scenery and after you pass by the stone monument, you will reach the Nishino-toge pass (1,370m). 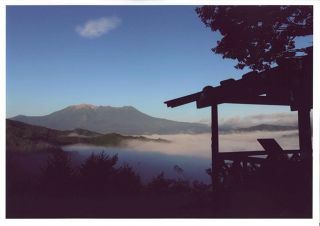 From the Shiroyama observatory (1,429m) in the pass, you will see the grand view of Mt. Ontake, Mt. Kisokomagatake, and Mt. Norikura. Walk down the mountain pass to the Yamashita residence, one of the wealthiest and biggest horse owner in the Kiso area. Archeological museum next to the Yamashita residence is a museum where you can see the historical heritage of Kaida from Paleolithic era to Jomon era. You can enjoy various sites on the Kaida Kogen highland in this course: stone buddhas, beautiful wild flowers by the stream, blueberry picking, Kiso horse riding and etc. Once you get off the bus, enter the walking course and you will see the Kumano Shrine which is believed for its blessing for long life and disaster prevention. On the other side of the blueberry field, you will see a Bato Kannon Goddess of Mercy which protects the horses' safety and a monument "Suekawa Hieda-no-hi". You will then get to the branching point of Kisouma-no-sato and Jizo-toge pass. If you take the Jizo-toge pass, you will see the tree of matchmaking and the observatory to see Mt. Ontake. A tour of local brewers of sake and monuments inscribed with haiku poem composed by Basho Matsuo. This course allows you to visit various places related to Yoshinaka Kiso. Starting from Tokuonji temple - a family temple of Kiso family and Yoshinaka Yakata - a museum of Yoshinaka, you will walk through the tranquil village to Tomoegafuchi. Enjoy the mystic scenery and head to Nangu shrine, Hataage-Hachimangu shrine, and to Miyanokoshi-juku and feel the history and the nature of the Nakasendo trail. ‘Ontake Kodo’ is a historical trail at the foot of Mt. Ontake. Fukan, a monk, created the trail leading up to Mt. Ontake called Otaki-guchi in 1792. This Ontake Kodo is less-travelled part of Otaki-guchi trail. Aburagi Burin is an ancient forest around the forth station of Mt. Ontake. It offers a great hiking opportunity from long and strenuous to short and easy. This page introduces an easy 40-minute hiking with a variety of plants and two different waterfalls. 'Kiso Kodo' is a historical trail that was made through the Kiso valley before the Nakasendo trail. You can still walk part of the trail. Located close to central Kisofukushima, Joyama attracts many hikers. Its features include the historical Gongen Waterfall and Momijigaoka which offers a great view of Japan Alps. A hiking route from Kamiya Shuraku (village) to Kiso-mura roadside station. First half of the hiking will be on a single track in a wooden area. There is an open space at the Kamiya Pass for you to rest. The second half will be in a forest road (downhill) with a view of mountains such as Mt. Hachimori. Kiso-mura roadside station (goal) is in the Yabuhara area which is the start point of the Torii Pass hiking course. You can continue your hike to Narai. The starting and goal point of this walk is Kiso Fukushima station. Walking through the post town and riverside, you will see both the historical sites and the nature of Kiso. You can see Uenodan - the historical townscape, Takase museum - related to novelist Toson Shimazaki, Fukushima Sekisho - one of the four important checkpoints in the Edo period, Kozenji temple - the treasure house and dry stone garden, the grave of Yoshinaka Kiso, and Yamamura Daikan Yashiki - the residence of the local govenor in Kiso district. Take a train from Kisofukushima to Yabuhara. Then it is a 3-hour hike from Yabuhara to Narai via Torii Pass. This route is especially good for a beginner among many Nakasendo walking routes. It puts you in an Edo-Era atmosphere as Narai-juku, the longest post town, emerges in front of you after a relaxing hike. This 9km hike connects two beautiful post towns which takes approximately 2.5 – 3 hours. Magome-juku where the hike starts and Tsumago-juku where the hike ends are both worth visiting as they preserve the buildings of the Edo period very well.